Finance Minister Mangala Samaraweera said the Government had not taken shortcuts towards “populist” economic interventions but long-term pains that lead to lasting benefits, where every citizen can become a shareholder of the knowledge-based, highly competitive social market economy that has been envisaged under the Government’s Vision 2025 policy document. “We have inherited the adverse effects of myopic policies implemented in the past but we chose not to tread the same path. The benefits of these reforms may not fully materialise immediately, but with the combined efforts of all stakeholders we have the opportunity to collectively build a strong, sustainable and equitable economy and society,” Samaraweera pointed out. The Minister believes that the primary barometers for economic wellbeing are real wage growth and full employment. In recent times he said the perception of development had become somewhat unclear, where people thought it was associated with ports, airports, expressways, power plants and other mega infrastructure initiatives. “If a port is built which does not generate economic activity or an airport that does not attract any commercial flights, it may increase the GDP, but that cannot be considered development. Development, to define it succinctly, is the process by which a nation improves the economic, political and social wellbeing of its people,” he added. To drive competitiveness, Samaraweera outlined the need for economic resources to be diverted to activities that optimise output per worker, which requires a shift in economic activity to sectors where Sri Lanka is globally competitive and moving out of sectors where it cannot compete. “For instance in agriculture, around 30% of the labour force is engaged in the sector which only contributes to 9% of GDP. By protecting uncompetitive agriculture, we are in effect trapping farmers in low-wage economic activity. It is clear that we need to gradually shift into higher value agriculture in order to improve output per farmer and thus income per farmer,” he stressed. The Minister said the same principle applied to all economic sectors, many of which are uncompetitive but have been protected, stifling competition, innovation and real wage growth whilst imposing high costs of protection on consumers. “It is in this context that the Government has embarked on a shift in the economic trajectory of Sri Lanka from a protected domestic market-driven economy to a more outward-oriented economy. The future of our economic growth must be through exports, entrepreneurship, FDI and private enterprise,” he emphasised. Samaraweera said that to unlock the potential of the economy, the Government was implementing an economic program that included gradual liberalisation of the economy to attract private investment and instill more competition whilst providing a safety net for those adversely affected by competition. While gradually phasing out para tariffs to encourage competition and reduce the cost of living, the Minister pointed out that the Government had already passed anti-dumping legislation and legal safeguards to protect against unfair trade practices. “In fact, I removed 1,200 para tariffs in the last Budget and we have committed ourselves to removing all the 3,000 odd para tariffs by 2020. I also hope to remove another 1,200 para tariffs this year,” he added. It was noted that the Government had also designed a Trade Adjustment Program that will provide workers with tools to reskill and provide concessionary finance to help firms affected by competition to enhance their competitiveness. 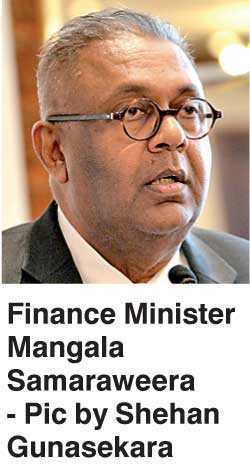 The Finance Minister believes that leveraging the trade-investment nexus will enable Sri Lanka to create high-value jobs and attract technology to drive productivity growth and real wage growth for citizens. In addition to enabling market access, he said it was also essential to address the supply side bottlenecks for investors. “Significant steps have been taken to improve the ease of doing business in Sri Lanka, particularly through the use of technology in administrative processes,” he pointed out. In the short term, he said the clear priority for the Government was to accelerate ‘Enterprise Sri Lanka’ and ‘Gamperaliya’, which could have a transformational impact on both rural and urban economies. Describing human capital as the greatest resource, Samaraweera said expenditure on education, higher education, skills and vocational training reached 2% of GDP in 2017 and will be 2.1% of GDP in 2018, while expenditure on health was 1.55% of GDP in 2017 and will be 1.69% of GDP this year. “Such expenditure on social infrastructure may not be visible like a megaprojectbut it has a meaningful impact on the wellbeing of people,” he stressed. Assuring that the Government had successfully navigated the macroeconomy toward calm waters in spite of precarious global conditions and onerous external debt obligations, the Finance Minister said it was clear that the Government needed to undertake more difficult and challenging reforms in order to drive future economic growth and development. Finance Minister Mangala Samaraweera said Sri Lanka will have to pay the highest debt repayments since independence starting from this year till 2020, which amounts to nearly Rs. 6 trillion. “This year records the highest debt repayment since independence, which accounts to about Rs. 1.9 trillion, nearly 82% from the pre-2015 era. The next two years are going to be more difficult because of the bunching effect, and we have to pay nearly Rs. 4 trillion for 2019 and 2020,” he said, addressing the Postgraduate Institute of Management Alumni Association (PIMA) CEOs Forum last Friday in Colombo. To illustrate this fact, the Minister pointed out that in the year 2017, Government tax revenue was Rs. 1,670 billion, whilst total debt service payment in 2017 was Rs. 1,603 billion. According to him, in the five years between 2010 and 2014, the average annual debt service payment was Rs. 990 billion. “Compared to 2014, the annual debt service payment in 2018 has doubled. Therefore, it is clear that the Government needs to undertake more difficult and challenging reforms in order to drive future economic growth and development,” Samaraweera stressed.